note: This is our architect-designed villa. We gladly help you to design a house to suit your individual needs. A well planned house designed by architects. The house serves both as a permanent living and/or as a second home. 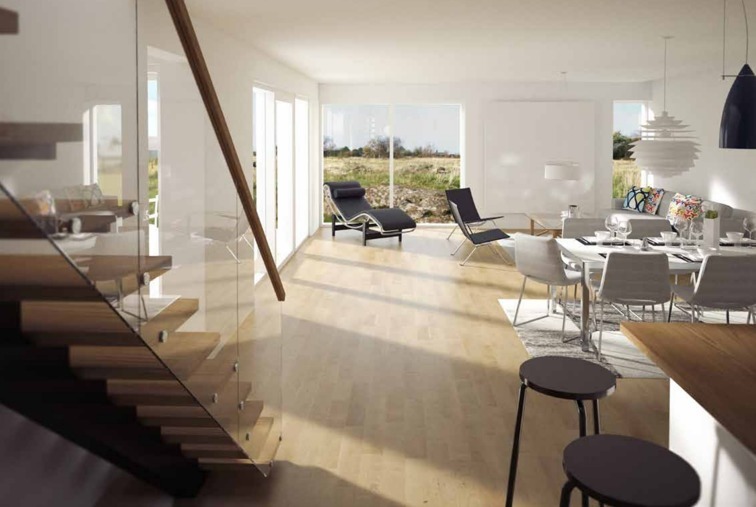 The house meets Boverkets requirements for an all year round living, leading to low energy costs. Underfloor heating provides a comfortable indoor climate. The exterior walls are made of horizontal powerful panel, painted twice. This provides long term protection against wind- and water. High-quality windows and doors means minimal maintenance for you. The bathroom, WC and shower are equipped with clinker on the floor and all walls are fully tiled. The bathroom includes a sink, commode, mirror cabinet, toilet paper holder, towel rack, toilet and wash basin. Our villas have two entrances. The main entrance is big and welcoming. The second entrance leads direct to the laundry room including washer, dryer and cabinet interiors. The floor is made of clinker which makes it easy to keep clean. The laundry room also has an exhaust pump providing the house with fresh air and keeping the energy costs down. There are three to four toilets/WC depending on which type of house you choose. This means our villa is comfortable also for big families. The kitchen has furniture from Marbodal and equipment from Electrolux. The equipment includes fridge, freezer, induction cooker, oven, microwave and dishwasher. The house has parquet floors made of oak. The interior walls are painted white. Particle boards are placed behind the plasterboard making it easy to mount paintings and shelves to the walls. The extra storage area separated from the house is fully insulated from the beginning. A carport is included. Your car is always protected! The terrace is made from wood and is included in the house. The lawn is finished. Paving included both at the entrance and driveway. Even the mailbox is set up. You can move in and enjoy your new home from the first day! solsidan gives that little extra!